This licensed Disney Princess 2 Combo C4 inflatable jumper injects the latest in fairytale fantasy to any event or Party Rental. Each participant is welcomed by Ariel, Cinderella, Tiana, Belle, Jasmine, Aurora and Snow White, dressed in their princess best! Visitors will engage in enchanting play inside this inflatable jumper with one of four activities, including a fantastic dry slide. 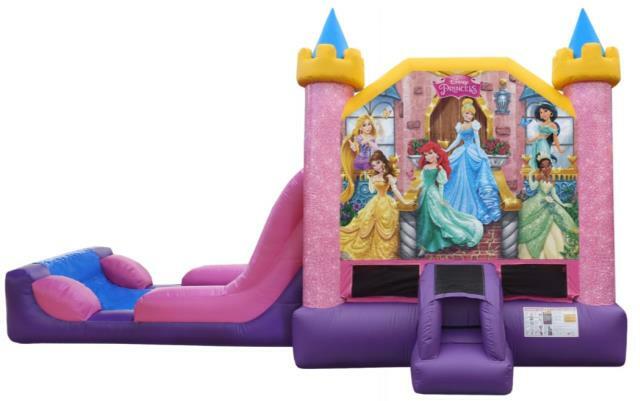 This Disney Princess 2 Combo C4 inflatable jumper is a perfect fit for a princess birthday or any large event and is part of a line of Disney Princess 2 products, with jumps, combos and a 3D combo bounce house. This C4 bounce house combo offers up four different activities for endless hours of activity. Each bouncy house has a large interior jumping area and a basketball hoop for group interaction, and high-visibility mesh allows spectators to keep an eye on participants. The C4 jolly jumper comes with a climb to conquer with a fun and fast slide, entertainment for even the most active child! Each bouncy castle is manufactured with lite n strong , fire resistant vinyl and comes with all the necessary bounce house accessories. * Please call us for any questions on our disney princess bounce combo rentals in Eastlake OH.